Size (inches): 16.34" X 12.40" X 1.57"
Books magically come to life with voices, music, silly sounds and games while children learn to read. With the award-winning LeapPad learning system, children are always engaged, always having fun. And with more than 50 interactive book titles in the library, they'll be learning something new for years to come. 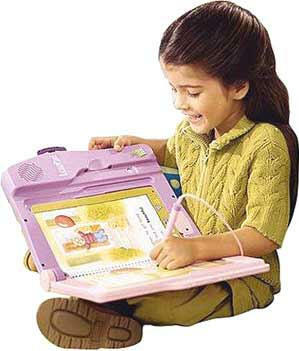 Children place a book on the LeapPad player, pop in the cartridge, and touch any page with the Magic Pen to hear words and stories read out loud, learn letter sounds, hear lovable characters come alive and play learning games. Each book is packed with engaging activities, games, stories and facts that make reading and learning fun. Kids are constantly changing. That's why each of our LeapPad platforms is different. 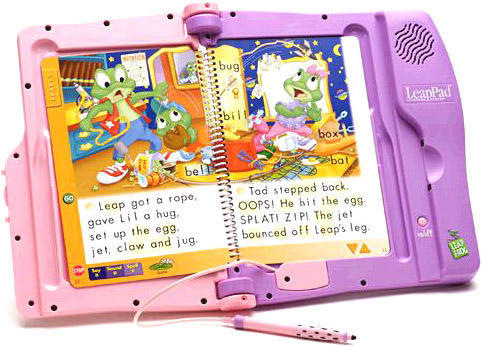 The LeapPad Learning System uses a larger platform and thinner pen designed for preschoolers and kindergartners to introduce them to the magic of books and reading. And the library is organized by grade to teach reading, phonics, vocabulary, math, science, music and much more.